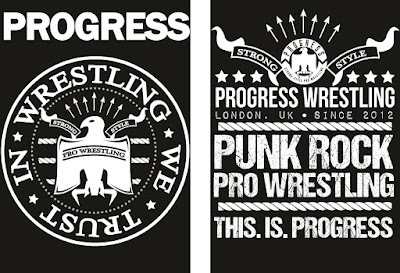 This week with the festive period upon us, I've decided to look at individual wrestlers and promotions merchandise...you know, T-shirts, Hoodies and much much more. 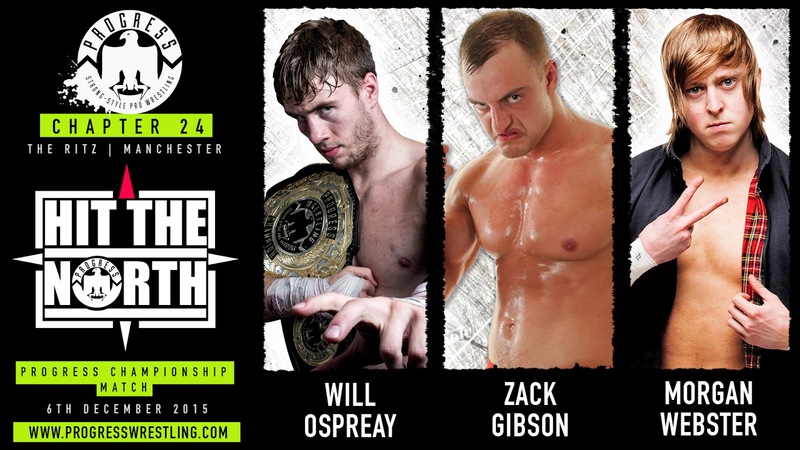 So let's start with a wrestler who's merchandise is almost as famous as he is, that man is Noam Dar. Noamdar.bigcartel.com is the site where you will find multiple variety of fantastic T-shirts available in Unisex sizes from S to 3XL priced from £15 and above. A superb Black or White Tee (pictured) featuring YOU ONLY LIVE FOREVER print in either white or gold on black or blue on white is available. 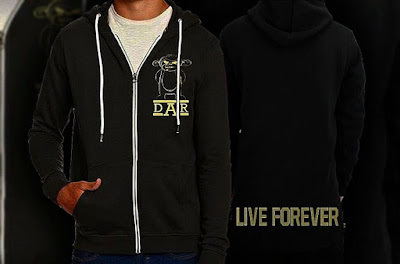 Now available is the Super Comfy 300GSM Cotton/Polyester Hoodie with two front pockets, contrast white Zip & featuring Gold sheen DAR Logo on front chest and back waist "LIVE FOREVER" logo. This is available in Unisex sizes S - 2XL priced at just £30. 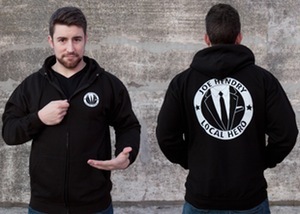 My choice is the new Zip Hoodie "For only the most dedicated Local Hero fans, the zipper hoodie comes complete with small logo on the front and a giant one on the back, so there is no doubt who you've chosen to support. Join the hen-party today and invest in this iconic piece of wrestling apparel" available in sizes M to XL priced at £30, also his 'Local Hero' T-shirt is available as well from sizes S- 2XL priced at £15. And you may gave noticed the name Big Cartel appearing several times, well who are they? "For nearly a decade, creative people from around the world have used Big Cartel’s simple tools and resources to build a unique online store, manage and sell their work, delight their fans and customers, and run their business their own way"
Targeting Wrestling Promotions, we look at a promotion's merchandise that has continuously sold their wrestling events in record time, that is Progress. Chapter 24 "Hit the North" DVD. "Our Manchester début was just a little bit special… and you can now PRE ORDER the limited edition 2-disc DVD. PLEASE NOTE THAT THIS WILL NOT BE SHIPPED UNTIL JANUARY. Order before the end of December 16th to get a £1 discount (usual price £14)." "We had our Ultras vote on their favourite t-shirts from past PROGRESS designs and we have decided to reprint the two most popular. As we pride ourselves on being Punk Rock Pro Wrestling, our version of the classic Ramones logo initially sold out a long time ago. It’s now time to bring it back, so make sure that you get one for yourself before they’re gone permanently again!" Available in Unisex sizes S - 3XL also in Lady Fit T-Shirt Sizing S-2XL priced at £17. William Regal "Made in England" Authentic T-shirt available in sizes S - 5XL as well as the Finn Bálor "Bálor Club" Unisex Lightweight Full-Zip Hoodie Sweatshirt, "Our Unisex zip hooded sweatshirt is made with soft, lightweight fleece and a slim fit. Features jersey lined hood, heavy gauge drawcord with metal eyelets, #5 metal kissing zipper and 1x1 ribbing at cuffs and waistband", available in sizes XL- 2XL priced at £44. And finally Daniel Bryan "Yes! : My Improbable Journey to the Main Event of Wrestlemania Book"
"One of WWE's most unlikely champions of all time and also one of its most popular, Bryan has proved to the world and to all of WWE that looks can be deceiving. Just ask anyyone who's ever underestimated him . . . right before he went out and whipped the WWE universe into a frenzy. This is Bryan's behind-the-scenes story told for the first time ever by the "YES!" Man himself---from his beginnings as a child wanting to wrestle to his ten years circling the globe on the independent circuit and his remarkable climb to the upper ranks of WWE."